If you are like me and spend most of your year avoiding potatoes and fried foods, then you will certainly love this potato latke recipe for Chanukah. Most Jewish kids I knew regarded Chanukah as a special time, but somewhat less special than Christmas. And for many good reasons. One, it often didn’t happen when there was no school. Two, there weren’t any TV special cartoons about it. And three, nothing that amazing to put in your mouth came out of it. Sure, there was great food but nothing that made your head explode. (I was somewhat shocked to realize that donuts are a traditional Chanukah food since they were never ever made or served when I was growing up). Potato pancakes were served, but after you make these you’ll realize why not often. They take a lot of work and they cause a lot of suffering (crying from onions; bleeding from the grater; burning from the oil; heartburn from inability to stop eating them). And, they are by no means health food. But they do remind us of one of the central ideas of Chanukah—which is that the oil we thought would last for one night actually lasted eight nights. A great way I’ve found to make one night of oil last is to consume it by frying potatoes and onions in them and then they stay with me for at least eight days (or five if you go to the gym a lot). Of course, I loved the latkes I ate growing up (with apple sauce), but I could never replicate them. They would come out too fat, too potato-y, too flavorless. After years of experimenting, I realized that when they are made right, latkes should resemble a crispy hash brown that you are invited to eat without silverware, ketchup or a side of eggs. At my house, they never make it to table unless I have the discipline to start a long time before company comes. Otherwise, we all just eat them as soon as they’re ready, and then no one wants to eat brisket, soup, or anything else (until later, when the donuts are served). 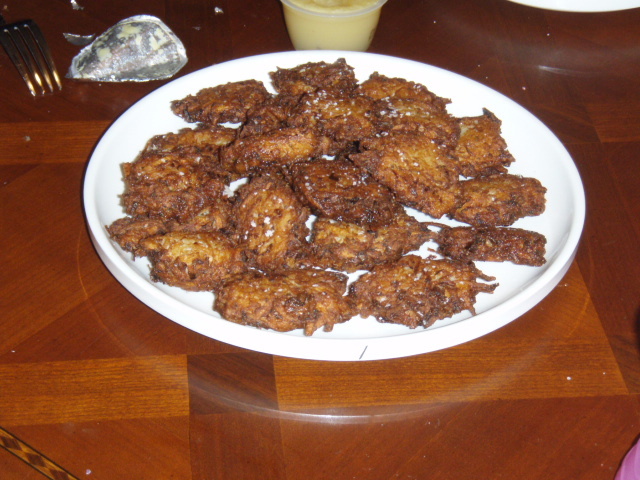 There was a post I found a few years ago called “Possibly the Best Latkes We Have Ever Eaten” by a NY Nosh (whose site was inexplicably replaced by a large picture of a leaf). That recipe, (reposted here) called for boiling half of your potatoes which is a great concept but one that I believe results in some kind of crazy knish-latke hybrid which is delicious but not a latke. So if you’re having friends from the Midwest in who’ve never eaten a potato pancake, by all means, go ahead make that one. If you want a more traditional latke, this is the one for you. On a tip from a friend, I started using half sweet potatoes. I know that sounds like a crime, but it’s not. They have almost the same exact consistency and a little bit of a sweet flavor. It also makes them look more interesting, with their orange-and-white stripes. If you can’t bear the violation of tradition, then use all-white potatoes. In large bowl, grate potatoes and onion together. This will help the potatoes not turn brown. Once you’re done grating, you’ll need a separate bowl with which to squeeze EVERY BIT OF LIQUID OUT OF THE POTATO ONION MIXTURE. So, you will have three bowls: one that currently has your wet mixture in it. One that you will squeeze the liquid in to; and one where you will put the dried mixture. This is important, because the one thing my mother-in-law taught me was that after you squeeze out the onion/potato mixture (and you wait) you’ll note that a white substance, like wet flour, forms and will remain, after you pour out the liquid. THAT IS MAGIC STARCH. Scoop that up and mix it in to your now dry potato-onion mixture. Then, add the egg, matzoh meal, salt and pepper. Lots of recipes call for patties but I prefer using an ice cream scooper. You pick the size, it’s your diet. Drop scoops into hot oil. It should sizzle when this happens. Try a sample scoop to make sure. You want your oil hot but not smoking. It will take one or two (which you, the cook, will be forced to eat) to get it right. I like to flip over the latkes and press them flat. But you don’t have to. When done, the latkes will have a crispy light brown look. Remove them with a slotted spatula or tongs and dry on a paper bag (some people call for paper towels but I find them inefficient). Salt them when they come off. Hand to people who are standing near by. Follow with a shot of apple sauce, or don’t, the latkes have already made the celebration special. Posted in Sides & Salads and tagged Chanukah, Fried hash browns, Jewish food, latkes, Potato Latkes, Potato pancakes, Robert deutsch, sweet potato latkes on December 7, 2014 by Robert Deutsch.